What are the chances a movie about the making of a movie will achieve greater acclaim than the original film did? 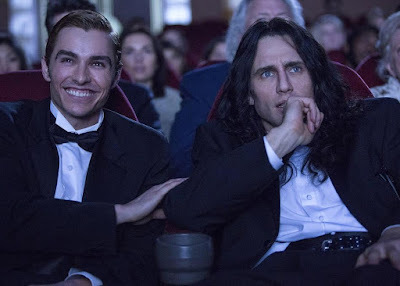 In the case of The Disaster Artist, which details the making and bizarre cult status of Tommy Wiseau's The Room, the chances are very likely, especially after a critically lauded debut at SXSW earlier this year. Written and directed by James Franco, who also plays Wiseau, the film aims to be a heartfelt but funny tribute to a movie that still gets played in theaters regularly most weekends and is attended by loads of fans. There's just something about the wooden acting and atrocious dialogue that people find endearing, and even in this trailer you can tell Franco and the impressive cast he assembled have a love for The Room, too. Such as it was. The film is based on the book by Tom Bissell and Greg Sestero, based on Sestero's experiences as one of the co-stars. Sestero is played by Dave Franco, while the impressive cast is includes Seth Rogen, Jason Mantzoukas, Josh Hutcherson, Zac Efron, Ari Graynor, Sharon Stone, Jacki Weaver, Hannibal Buress, Alison Brie, and more. So, uh, a lot more star power than The Room ever came close to having. The Disaster Artist opens in limited release on December 1st, then goes wide a week later.